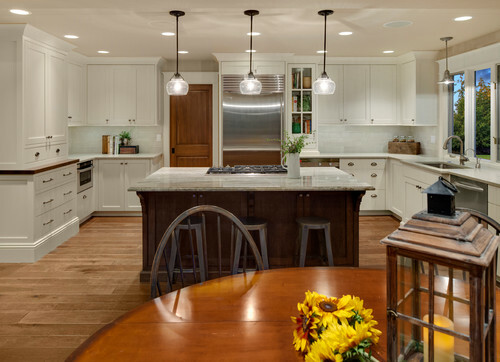 Lighting a kitchen island with pendants can be tricky. How many you need depends on the island, the size of the light, the height of the ceiling and your personal preference. You never had to worry about kitchen lighting much 20 years ago, there were galley kitchens, so recessed and under cabinet lighting plus a surface mounted light would be sufficient. However, lifestyle has changed and now the kitchen and formal dining space are often merged into one room. Now you should light this area using task, decorative, ambient (up lighting) as well as accenting any pictures or other objects. 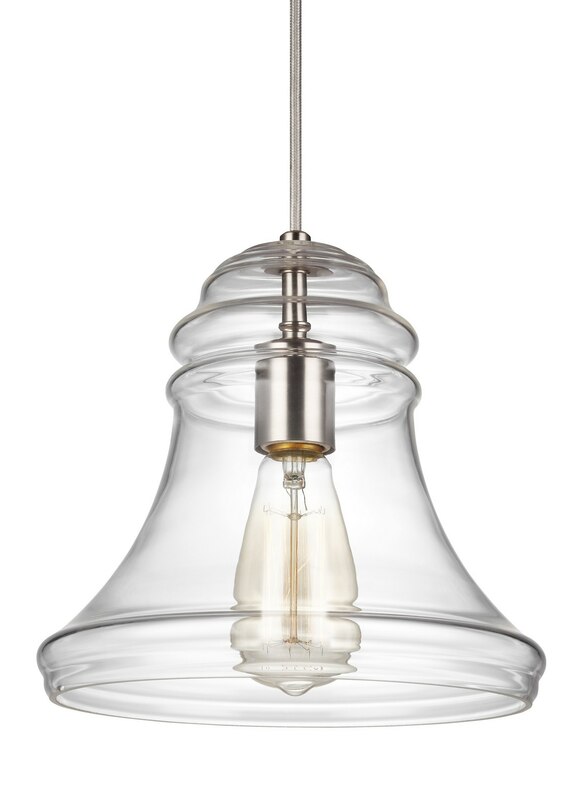 Pendants have surpassed chandeliers in popularity because they can be better at lighting longer, more rectangular spaces. The problem for you and everyone else looking for help is: how many pendants do you need to light the kitchen island? So, we will attempt to answer that question as well as show you a few applications. 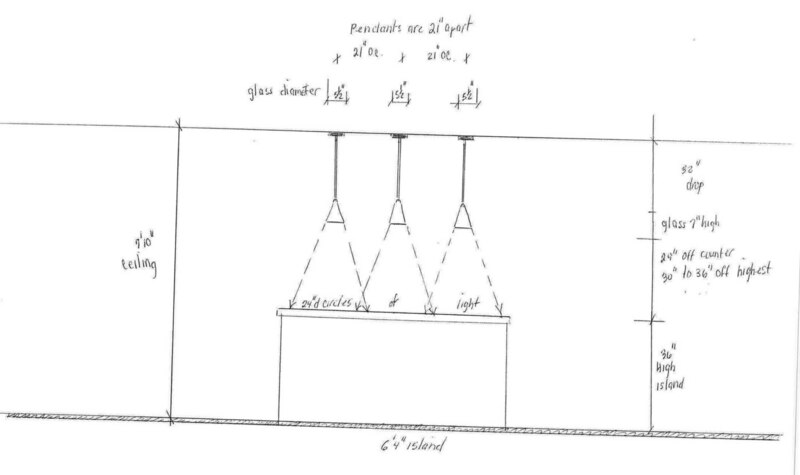 How much light do I want? If I want to mostly entertain at the island and have indirect or less light with larger pendants for a more dramatic effect. As an example, this 6-foot, 4-inch island has three smaller pendants with a 5" diameter and 7" high. The ceiling below is 7-foot, 10-inch which is a fairly common ceiling height in this area. The circles of light created are 24-inch in diameter and cover the length of the island evenly. The pendants are 29-inches off the counter and have a drop of around 32-inch. You can raise the pendants a bit but not too much. You do not want the pendants to look too short. 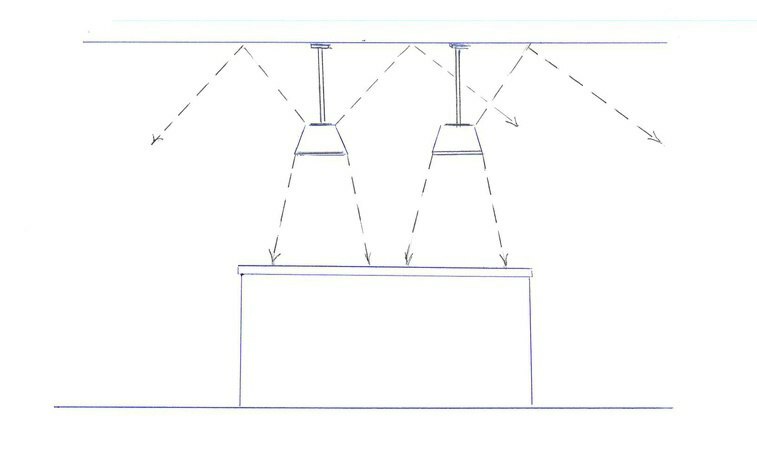 Next please see the same island with the same ceiling height using two larger pendants. 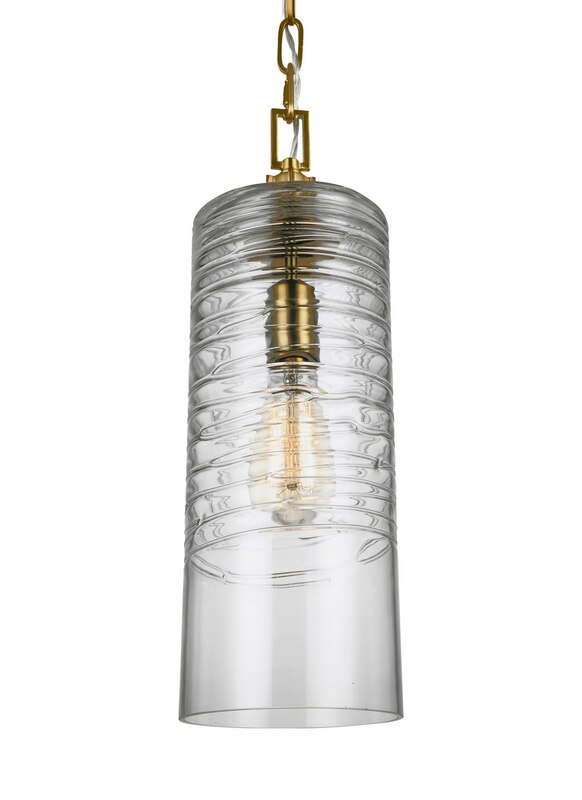 These are 14" diameter pendants with the top open to give ambient, indirect up lighting. The circles of light are still only 24-inch which leaves some shadowing. 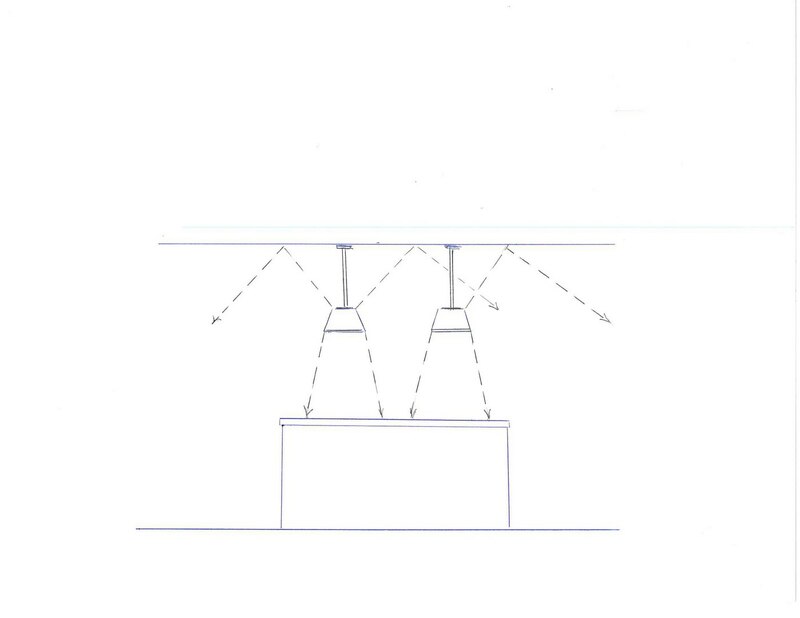 However, as long as the pendants are either glass or open at the top you will get some diffuse light reflected Off the ceiling which helps to soften the shadows. The size of the light circles is determined by the distance away that a light is. the bigger the light circles on the floor. 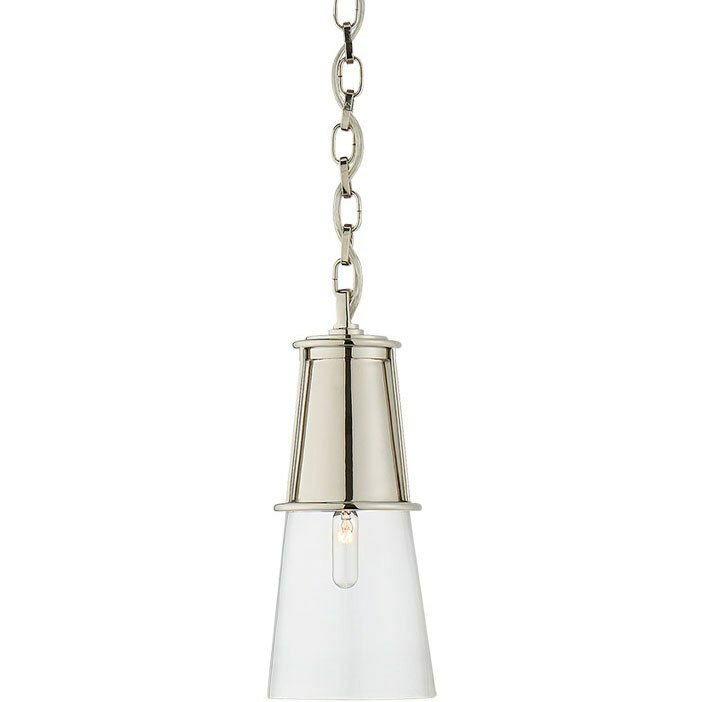 The larger 14" pendants create a more dramatic look and the larger pendants are seen more and more on Houzz and HGTV. For the 6-foot, 4-inch island you want to at least have and 11" minimum on two pendants or it can look like "Honey I Shrank the Pendants" and will look almost disproportionate to the island itself. Now look at some actual examples. 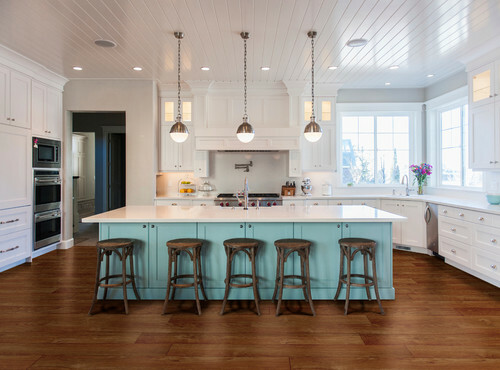 This is a perfect example of a 7-foot island with three pendants. You can tell because this island seats three people and each seat takes 2 feet with plenty of space in between. This ceiling is more in the 8'6" high range and allows for a slightly larger scaled pendant as these pendants are 10-inch in diameter. Above, these pendants are 16" in diameter over an 8-foot long island and the ceiling height is at least 9 feet or more. 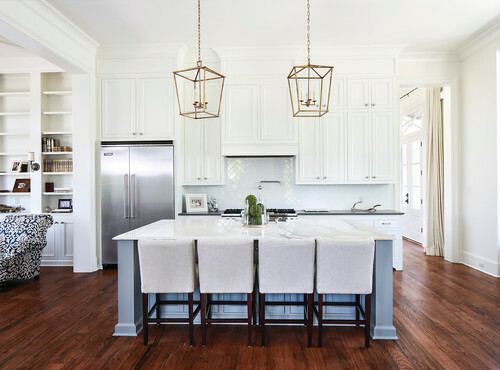 A perfect tip to remember is the higher the ceiling and the longer the island the bigger the pendant should be so that it fits the scale of a longer island. It should also be taller to fill up the more voluminous space. Good when using three on a 6'6" to an 8' island. Use three of the above on 6'6" to 8' long islands. Visual Bracelet Pendant 8" by 12"
This is great as two for a 6-foot island or three for an 8-foot island. Visual comfort 14" by 16" with chain and canopy $398. This is perfect for two pendants on a 6 -foot to 8-foot island. I love the Katie by Visual Comfort in 12" by 10 ¾" H. Good for the 6-foot island when using two and the 8 to 9-foot island when using three. 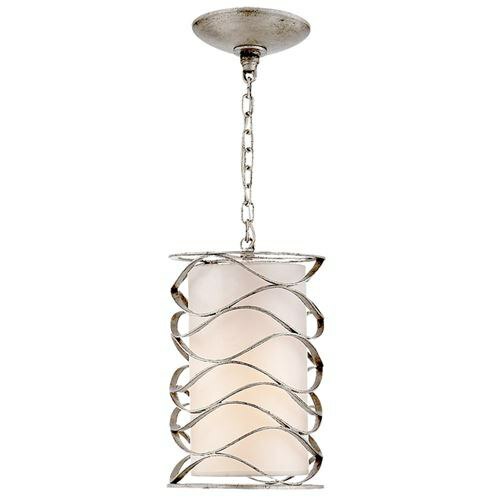 A great transitional piece which comes in brass, polished nickel, and bronze. Available in clear, opal or seedy. I like the seedy as it gives that clear feeling and yet cut glare. With so many wonderful options for pendants in a myriad of sizes, you will have a hard time deciding. 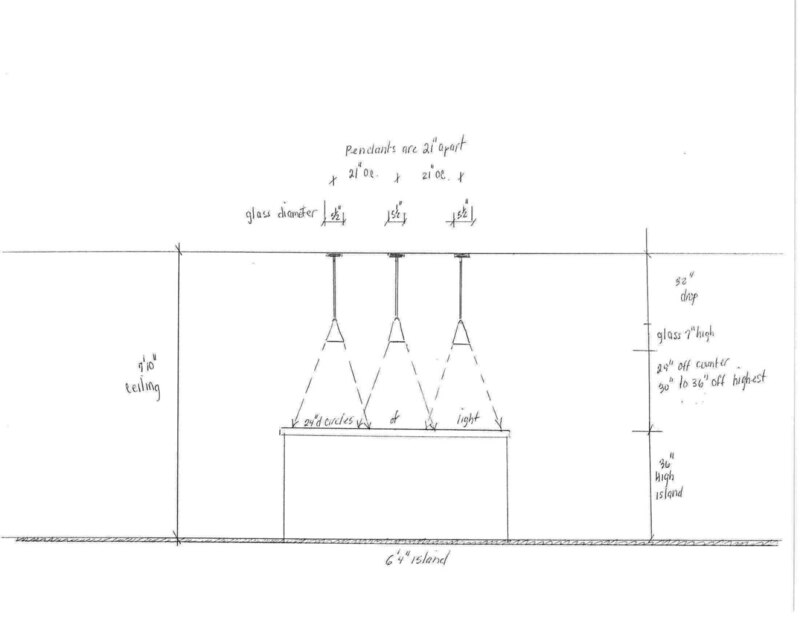 At least armed with the information on length of island, height of ceiling, and height of island we will be able to size up the scale and number of pendants needed and that will make the decision process a little easier. 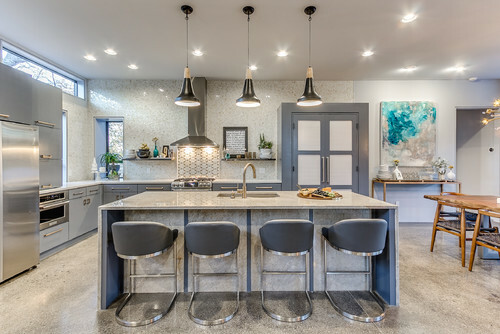 Get our free Kitchen Lighting Buying Guide with tips, trends, and plans for planning your kitchen lighting design. Over 220,000 people have already found answers in a Yale guide.